If you're looking to get physical with your laptop music, the Easy-3 set is an excellent, comprehensive solution. Lots of control across all three units, decent build quality, widely assignable. Mini keyboards don't make for easy performance, the manuals are on mini-CDs. A 25-note keyboard is one of three controllers included in the package. If you're a laptop-based musician, you'll know how frustrating it is to feel tied to your computer keyboard and mouse trackpad to input your musical ideas. Whilst it's certainly possible to input notes, tweak synthesizer parameters and set mixer levels using your mouse and key commands alone, it doesn't feel nearly as satisfying as doing it via physical controllers. That's where SubZero's Easy-3 3-Piece MIDI Controller Set comes in. It's pretty much what it says on the tin: three units in one bundle, comprising a keyboard, drum pads and a faders and rotaries bank, all of which are compact, portable units. First up is the EasyPad. This offers 12 rubberised, velocity-sensitive pads, designed first and foremost for drum pattern creation. However, via software, the pads can also be assigned to MIDI controllers, so they're not limited to note input alone. There's a nice feel to these pads - they don't mind being thumped hard and they offer good resistance. Next to the pads, an X-Y slider control is also assignable to the parameters of your choice. Underneath this there are two unlabelled grey buttons that provide yet more user-defined control. Transport buttons help you drive a session directly from the controller, and you can save up to four different configurations of your settings to the EasyPad, ready for recall at the press of a button. 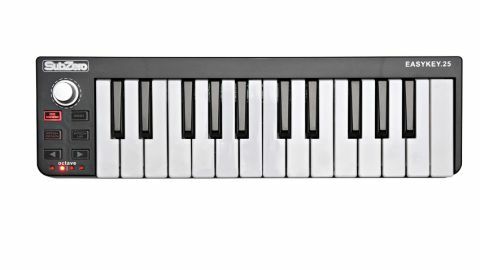 The EasyKey25 offers 25 notes (two octaves) of mini-key controller keyboard action. Its range can be extended easily using octave up- and down-arrow buttons. As with some of SubZero's bigger MIDI controllers, you can forego the keyboard's note input facility. Click into CC mode and all of the keys become MIDI control change message generators instead. Back in keyboard mode, pitch bend and modulation manipulation is possible, albeit in a compromised form. You'd normally expect these parameters to be controlled by wheels, but here they are controlled by buttons so don't expect the same degree of tweakability. This controller will certainly enable you to input notes more quickly and intuitively than your laptop's keyboard, but mini-key keyboards aren't to everyone's taste. On the upside, like the other members of the Easy-3 trio, the EasyKey25 will comfortably fit inside a laptop bag. Last but by no means least, EasyControl offers a fader bank with nine dedicated sliders. The last of these is assigned to MIDI controller number seven to control volume. Above the faders are a series of rotaries which, over software, are assignable to the parameters of your choice. If you're intending to use EasyControl as a mix control surface, setting these to control pan would make most sense. Beneath the sliders, a row of buttons can also be assigned (mutes or solos, for instance).Two more buttons, a rotary dial and an A-B X-fade slider complete the control set. As with the EasyPad, you can save four banks of your settings for easy recall. Good things come in threes and that certainly seems to be the case with this trio from SubZero. If you're looking for a complete set of portable MIDI controllers that are as powerful and they are flexible, check out the Easy-3.